Jaiel Pulskamp gets a coffee at the Post Office Cafe, in Worcester. 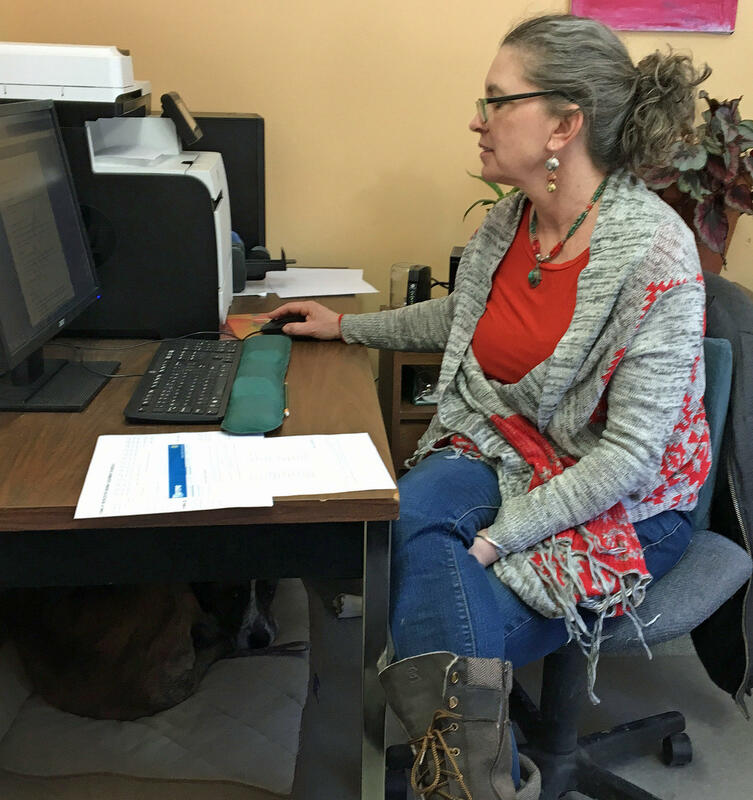 In addition to working on her farm, she's a field organizer for 350 Vermont's Generate New Solutions Campaign to bring renewable energy discussions to town meetings across Vermont. Jaiel Pulskamp is spearheading the effort, and she says the state isn't on pace to achieve its goal of reaching 90 percent renewable energy by 2050. "If we were to be meeting those goals," she says, "we would have a lot more renewable energy infrastructure in Vermont by now. And so we’re really behind." Pulskamp lives and farms in the central Vermont town of Worcester. As a farmer, she says she understands what it’s like to be dependent on fossil fuels. "There are a lot of people who make their living – I’m one of them – by using a lot of fossil fuels," she says. "You know, excavators. I’m a farmer. I drive a tractor. But I’m also for starting the transition to get us away from fossil fuels." Worcester Town Clerk Katie Winkeljohn accepted the petitions to put the renewable energy resolution on the town meeting ballot. She says it will likely pass in Worcester, as very few items ever fail on Town Meeting Day. The resolution won't look exactly the same in every town. All towns are including the first part, which urges the state to take action to reach its renewable energy goals and to stop fossil fuel infrastructure projects, such as gas pipelines. Then, Pulskamp says there is a second, optional portion of the resolution that local volunteers could customize for their town. She explains: "You know, solar panels on the school roof, or the town hall, or weatherizing the town buildings. So they could add anything they chose." Article 13, above, is the resolution as it appears on Worcester's Town Meeting Day warning. In some towns there is a second part to the resolution, spelling out specific actions the town should take. But Pulskamp says other towns have added local goals. Annie D’Olivo heads up the citizen environmental group Earth Matters, in Manchester. Her group is working with volunteers and select boards to get the resolution on the ballot in eight towns in the southwestern part of the state. She says those resolutions include encouraging the weatherization of town and school buildings. "Some places in Vermont, the resolution included green transportation," says D'Olivo. "And we would have liked to have done that, but most of the select boards decided that that might be one step too many, so we’ve tried to keep it moderate so that we would appeal to most people and get the major things through." The resolutions are advisory – they don’t bind the towns to taking specific actions. But Pulskamp says she hopes the local discussions will send a message to the state. And, she says, the resolutions will jumpstart conversations on the local level. Even before Town Meeting Day, those conversations have already started, as volunteers like D’Olivo meet with select boards and canvas for signatures. Some town select boards agreed to put the resolution on the warning. In other towns, volunteers had to gather signatures from at least 5 percent of the voters. And D’Olivo says, in Manchester, the message has been well received so far. "There were very, very few people who refused to sign," she says of the petitions. "I think I could break-out them on one hand." And Pulskamp says passing the resolution on Town Meeting Day is just the first step for towns committed to the cause. "It’s not a done deal," she says, "once it passes in the towns on Town Meeting Day; then there’s a lot more to do – meeting with energy committees, you know, creating an enhanced energy plan. For those towns that don’t have energy committees, they should form one. And yeah, so it’s a process." Pulskamp says the process will start all over again next year, when 350 Vermont plans to get the resolution on the warning in even more towns. Update 9:30 p.m. A photo caption was edited to adjust Pulskamp's job title. For the 60 weeks since Donald Trump was elected President, demonstrators have spent Tuesday evenings standing with signs in front of Johnson’s village green, even braving recent sub-zero temperatures to uphold the streak. Black River High School students, from Ludlow and Mount Holly, have been studying together at Black River since middle school. But unless a vote held in November is reversed, their school could be closing before some of these students graduate. The Vermont Department of Environmental Conservation is abandoning a rulemaking effort for Great Hosmer Pond. Instead, the department is examining new ideas for managing competing uses on all of Vermont’s lakes and ponds.